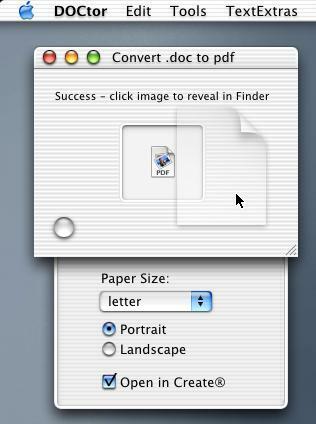 Freely open .doc files as .ps/.pdf! If people email you a WORD document (.doc or .DOC) and you don't have Microsoft "Word", it's a pain. DOCtor translates these files into PostScript - and, if you have Stone Design's PStill™ distillery installed (it's one of 7 apps in the Stone Studio™), automatically converts it further into Mac OS X friendy PDF. If you have Stone Design's Create® design and web authoring package installed, DOCtor opens the PDF in Create®, otherwise you'll see it in your favoriter PDF viewer, settable in Finder's Show Info when a PDF file is selected. You'll see a round jewel on the conversion window -that's the "Open drawer" button which exposes two options: page orientation (Portrait or Landscape) and page size (letter, legal, executive, tabloid, folio, note, quarto, statement, a3, a4, a5, b4, b5 and 10 by 14). Set these before you drag on a WORD .doc. Since you read this far, here are the details: DOCtor has inside of it "antiword" - a UNIX executable. True to the GPL spirit, the source to antiword is also included for you! Mac OS X port: Ronaldo Nascimento. by Andrew C. Stone, Stone Design Corp and distributed under the GPL. Create is a registered trademark of Stone Design Corporation. UNIX is a registered trademark of the X/Open Company, Ltd.